Rafael Nadal captured his seventh French Open title in 2012, surpassing previous record-holder Bjorn Borg and furthering his reputation as arguably the best clay-court player of all time. But after a surprising second-round loss at Wimbledon last June, the 26-year-old from Mallorca, Spain heeded the advice of his doctors to take a break from tennis to heal a knee injury. Weeks turned into months as Rafa reluctantly withdrew from the Olympics and the US Open, still waiting for signs of physical improvement. Eventually he announced the details of his ailment: Hoffa’s Syndrome. The Spaniard’s team opted to forgo surgery in favor of a rehabilitation regimen that would take him off the tour for an undetermined length of time. Despite his victorious re-emergence in 2013, the 11-time Grand Slam champion remained unsure about the future and indicated that he didn’t feel entirely recovered. 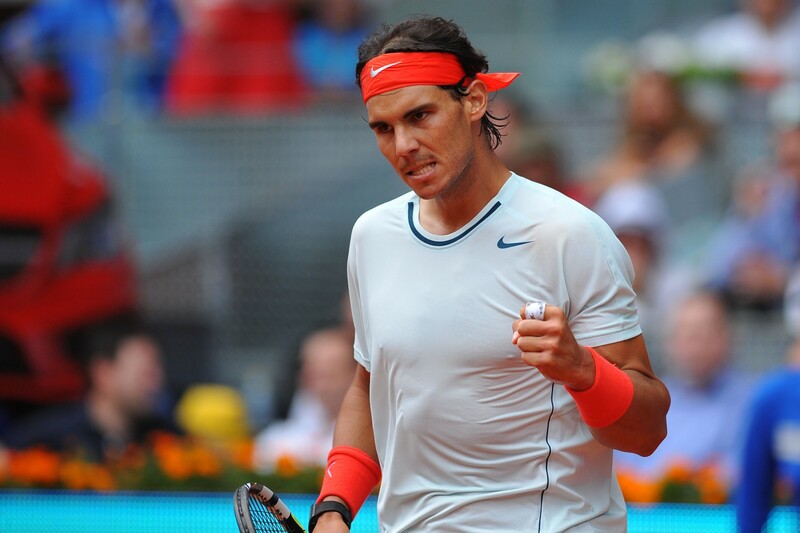 As play returns to Rafa’s favorite surface, will the reigning King of Clay retain his throne? Hoffa’s Syndrome is a condition in which the infrapatellar fat pad (soft tissue under the knee cap) becomes irritated and swollen. An extremely painful injury, the fat pad impingement occurs when the soft tissue that acts as a shock absorber in the knee becomes inflamed. Once he ruled out surgery, Nadal was forced to wait out the healing process, however long it would take. "I won't put deadlines for my return,” he told reporters after withdrawing from the US Open. “Right now I follow my knee's orders." Rafa made the best of his involuntary vacation by enjoying the extra time with his family and friends. He spent the summer at home in Mallorca for the first time in several years and traveled to Paris with his family. He channeled his competitive energy into winning an online poker tournament, beating 47 people for a prize of just under $200. The hardest part for Rafa was feeling time slip away. “When you see the months going and you see the tournaments going and you are not there in the draw, that’s tough,” he told Tennis Channel's Justin Gimelstob. Although a stomach virus derailed a 2013 Australian Open return, Nadal entered the clay tournament in Chile in February. After a seven-month hiatus, Rafa experienced immediate success: he was a finalist in his first tournament back, won the next two, then made history by seizing a record 22nd Masters Series title at the BNP Paribas Open in Indian Wells, Cali. “When you are out for a long period of time, it is difficult to come back and understand how to win the points, how to manage the important situations,” he explained. Regardless, Nadal defeated top 10 players such as Roger Federer, David Ferrer and Juan Martin del Potro. “When you come back after seven months, you really understand how much you miss it, all of this,” said Nadal. Nadal has won on every surface, including a career Grand Slam, but nearly 75 percent of his 53 titles were captured on clay. He holds the best win-loss percentage of all time on clay, 93 percent. The next highest is Bjorn Borg, at 86 percent. Rafa has dominated every important clay-court tournament since 2005: eight consecutive titles at the Monte Carlo Masters, seven total titles at the Barcelona Open and six titles at the Rome Masters. Not to mention a career match record of 52-1 at Roland Garros. He has long advocated for professional tennis to hold more tournaments on clay, which he believes is easier on the body than the unforgiving hard courts. Usually when the ATP World Tour returns to Europe in the spring to begin a season of clay-court tournaments, Nadal’s impending dominance is expected. This year, however, his extended absence from competition and vulnerable body may give opponents a sliver of hope that they have a chance against the athlete who relies heavily on a grinding, physical style of play. “I think I have doubts always, and I think it’s good because that makes me work really hard,” he said shortly after returning in February. But even as he started the year with an impressive 17-1 record, Nadal continued to express concerns about his health. “Sometimes today I am not able to play all the shots with my forehand that I used to be because I am not that fast yet to do it. That's why the backhand today is very important for my game,” he admitted. He also revealed that changing directions is hard on his legs. Rivals wanting to wrestle the crown from the King of Clay must play exceptional tennis, even if the reigning French Open champion hasn’t returned to top form. Roger Federer has the distinction of having ended Nadal’s 81-match winning streak on clay back in 2007, but the Swiss maestro has fallen five times at Roland Garros at the hands of his long-time adversary. Current world No. 1 Novak Djokovic is in a position to make a run for the title. A runner-up in 2012, Djokovic is motivated to go one better this year and capture the last major needed to complete a career Grand Slam. Two of Nadal's fellow countrymen, David Ferrer and Nicolas Almagro, consistently perform well in smaller tournaments. His good friend Juan Monaco of Argentina won three clay titles last year. None of those men, however, have broken through in a major. And the only man ever to beat Nadal at Roland Garros, Robin Soderling, has been injured and off the tour since 2011. For Nadal's part, expectations are high as fans witness his continued comeback during the grinding clay season. He says he'll take one step at a time and appreciate every victory. Nadal turns 27 on June 3rd, the second week of the French Open. Traditionally, the Spanish adult birthday celebration lacks fanfare. If Rafa, however, were to advance in the event and ultimately bite the Muskateers Cup trophy, that would certainly give his people reason to party.